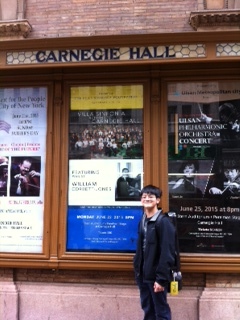 Here’s a poster we printed on display for an upcoming concert at Carnegie Hall! It is gloss laminated and 40×80 inches in size. Our process does a great job for things like this. Our new printers use UV inks that give you a poster that won’t fade in the sun. The colors are vibrant and accurate. Best of all, we ship the next business day, so a file coming in on Monday ships on Tuesday. If you are in a jam, let us know because we can usually ship your poster the same day if we have your file by noon. This entry was posted in Poster Printing and tagged marquis posters, movie posters, printing posters, theater posters. Bookmark the permalink.